In 2007, an artificial reef designed by Ben-Gurion University of the Negev (BGU) researchers was placed in the Gulf of Eilat to reduce environmental pressure on the region’s natural reef. Now teeming with life, a new study using the “Tamar Reef” shows that divers assign economic importance to aspects of reef biodiversity. These findings could help underwater conservation efforts. According to the study published in the ICES Journal of Marine Science, divers were willing to pay to improve the reef’s attributes and were able to differentiate and rank their preferences of biodiversity, numbers of fish and corals, coral species richness, fish species richness, coral size, coral abundance, and fish abundance. Respondents ranked biodiversity as the most desirable value, while fish abundance was the least important. “This result was exiting to us, since it shows that the general public as well as scientists place a high value on biodiversity and that visitors understand the fundamentals that constitute a coral reef community,” says Dr. Nadav Shashar of BGU’s Marine Biology and Biotechnology Program in Eilat, Israel. Dr. Shashar and his team surveyed 295 divers to evaluate their willingness to pay for improving various elements of a coral reef. They were shown a series of photographs of the BGU-created Tamar Reef with varied densities and compositions of fish and coral species. The researchers focused on the overall aesthetic value of each component, but also how divers’ aesthetic preferences compare with scientific biodiversity attributes that might be of interest for conservation purposes. The artificial reef project is a collaboration between Israelis and Jordanians to restore the local Gulf reef culture. The Tamar Reef was the first of four reefs installed in the Red Sea. Students and faculty from both countries work together in studying the artificial reef and how it affects the marine ecology in the area. 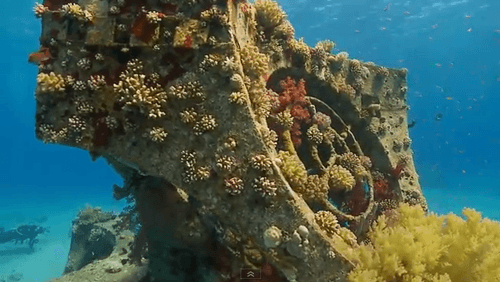 April 18, 2019 - Mystery 'ghost ship' to become part of Adventure Coast artificial reef FOX 13 News, Tampa BayA so-called ghost ship will soon sink to the bottom of the ocean off Hernando County to create the Adventure Coasts' first shipwreck dive site. April 10, 2019 - West Palm Beach Fishing Club installing artificial reefs in hopes of restoring the eco-system WPTV.comProtecting South Florida's waterways one artificial reef at a time. That's one of the goals of the West Palm Beach Fishing Club. April 1, 2019 - Graffiti Crew “Tags” Ocean Floor with Artificial Reef Surfer MagazineGermany's prolific 1UP Crew creates living art under the sea in Bali to promote ocean health. April 5, 2019 - Naples artificial oyster reef project gets underway Naples Daily NewsNaples Bay has lost 80% of its oyster reefs since the 1950s, but now the city is trying to turn the tide through its artificial reef project. April 18, 2019 - Louisiana tribe protects historic sites with oyster shells NOLA.comTons of recycled oyster shells will protect coastal areas valued by Pointe-au-Chien tribe.